If you are not satisfied with your purchase*, return the eligible product(s) in new and unworn condition in the original packaging for a full product refund or exchange . Returns must be postmarked within 14 days of the receipt of merchandise. Please include all paperwork, parts, and accessories. All products must be unused to ensure credit. For a refund or exchange you must first contact our returns department by emailing Cservice@customhide.com for issuance of an Return Authorization (RA) number, and instructions on how to proceed with your return/exchange. Since Christmas gifts are often purchased well in advance, any item purchased as of October 14, 2018 may be returned for an exchange or a refund if postmarked latest by January 1, 2019. As with any other return, item must be in its original condition. All conditions listed above apply. You may request shipping upgrade during the check-out process. To estimate the total delivery time for your purchase, please include the process time of the product, in addition to the time indicated by the shipping method. 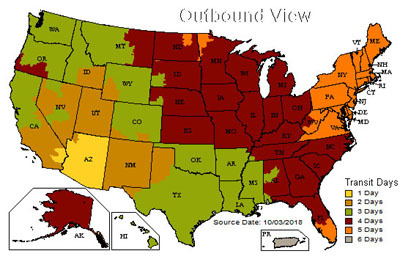 Please use the UPS ground map below as a guideline to help you choose the shipping method that is right for your needs. UPS, USPS or DHL will be responsible for a timely delivery once your package is picked up. Custom Hide cannot be responsible for unanticipated delays caused by above carriers.